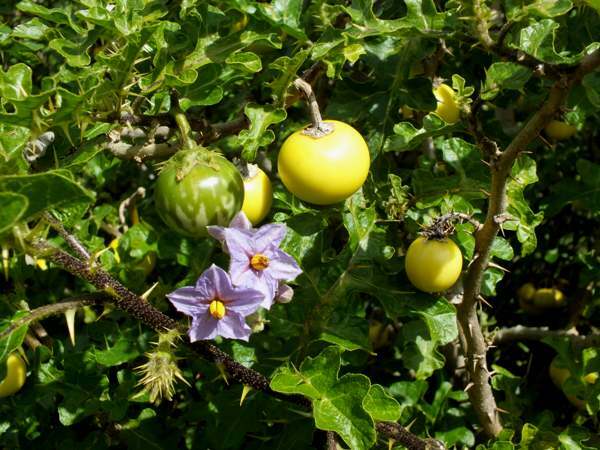 This relative of Deadly Nightshade is a poisonous plant. 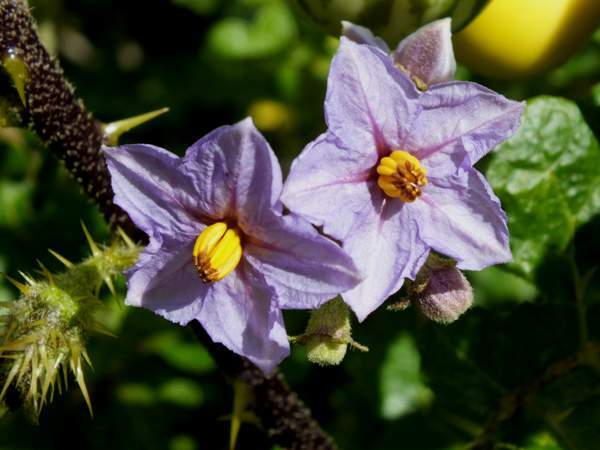 According to The Plant List the old name Solanum sodomaeum (attributed to Carl Linnaeus) is considered unresolved, and so the scientific name Solanum linnaeanum is accepted as the preferred name of this species. This perennial plant has attractive flowers each with five purple petals and small yellow stigmas, but it also has vicious thorns. The previous year's fruits can sometimes be seen ripening while the new season's flowers are attracting insect pollinators. The fruits are typically 3cm to 5cm across and look very much like unripe tomatoes; they appear in late summer; turning gradually from green to bright yellow and eventually black. The fruits are deadly poisonous and should never be eaten. Apple of Sodom, a native of southern Africa, is found occasionally in many Mediterranean countries and is considered a seriously invasive alien in parts of Australia and New Zealand. The pictures shown on this page were taken in the Algarve region of southern Portugal.